MINIMUM 7 DAY RENTAL CHARGE MAY 1ST - SEPTEMBER 15. Available In: St. Cloud & Ramsey! 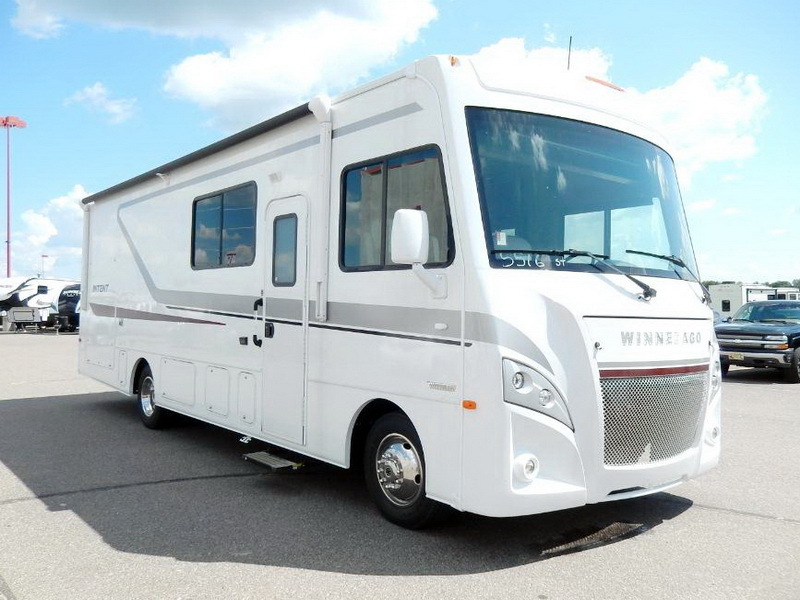 When you travel in this Intent Class A Gas motorhome, you are traveling in an exceptional RV that contains all of the amenities you want and need, plus many extra. The fully-stocked kitchen, which is located on the full-wall slide out, contains a residential refrigerator that gives you the space you need to keep your perishable items from spoiling, and everyone will love gathering together each evening in the warm summer air as you party underneath the 22' electric awning with LED lights. Why Rent from PleasureLand RV? Because at PleasureLand, your RV rental satisfaction is our number one priority to ensure your vacation is a wonderful experience. A breakdown on the road is very expensive for us-and even more inconvenient for you. That's why each of PleasureLand's vehicles is fully inspected and serviced between each rental. We follow strict maintenance schedules suggested by the manufacturers. At PleasureLand, we confirm reservations up to 365 days in advance, allowing plenty of time to plan your vacation, make campsite reservations, and select site seeing attractions. It also helps us to make sure our RVs are never overbooked. When you're considering renting an RV for your vacation, choose PleasureLand. We're confident you won't find a better RV for rent anywhere.